Until recently, on-orbit servicing of spacecraft was a difficult and complex task in space engineering. This year Orbital Express team first successfully demonstrates in orbit the mission ability to satellite servicing: autonomous capture, video survey of a spacecraft, transfer of fuel to satellite, robotic transfer of a battery and computer. Results show that such satellite mission would be far more cost effective than making an otherwise functional large satellite and purchasing its replacement. The TOOLSat project is one of several steps toward developing a system that will extend operation of various types of spacecraft. 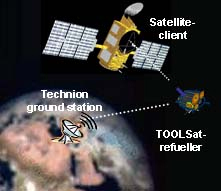 The word “TOOLSat” presents an abbreviation of student project full name “Technion On-Orbit Lifeguard Satellite”. The TOOLSat is a complete propulsion module for large active satellites that have consumed their fuel resources or encountered debilitating problems with their propulsion system. Refueling satellites will enable frequent maneuvers to improve coverage, change arrival times to counter denial, and improve survivability, as well as extend satellite lifetime. The project provides a definition of the small satellite LEO servicing system concept. It discusses rendezvous techniques, docking system design and ground segment operations; project was to examine both the economic and technical difficulties. To reach a client satellite in LEO, the service vehicle is first launched into initial orbit near the client’s orbit. TOOLSat used its internal propulsion system to roughly match the client final orbit until the distance between the two satellites gets smaller than 300 meters, where the TOOLSat video cameras is able to locate the beacon lights on the client satellite. Then TOOLSat performs a precision rendezvous and proximity operation using a closed loop approach. The TOOLSat rendezvous and capture activities use high levels of satellite autonomy and depend upon ground station for proceeding approval only. The maneuvers required depend on the differences between initial and final orbits. In worst case the maximal required Delta-V of the service vehicle is about 85m/s (maximal fuel consumption about 7 kg). Propellant tankage is shared between the client payload and TOOLSat propulsion system. This means that unused maneuvering margin can be employed to further extend the client satellite’s life. The TOOLSat completes the maneuver from initial orbit to final docking in less than 15days. The TOOLSat satellite design is based on hexagonal prism main structure. The structure includes aluminum 6061-T6 trusses. The solar panels are mounted on three out of the six joining faces of the satellite. The docking system is located on the satellite base face, backward thrusters – on opposite base face. Most of the dry mass is the fuel tank and the structure to support it. The position of the components was chosen such the center of gravity of the satellite will lay approximately on the longitudinal axis in order to avoid parasite moments and to ease the attitude control. Static analysis was performed to simulate the launch phase – static 10g acceleration. Trusses’ cross-section was chosen to be 30×30 mm² which gave the satellite its robust frame. The docking system provides the capability to dock on any fitting satellite. The system contains a cone which is inserted into the target satellite’s passive docking system. A pre-lineup of the satellites is achieved with a flexible metal cable that locks on to the target satellite. The satellite thermal analyses were made by professional COSMOS software for all flight stages. The thermal control system keeps each of the TOOLSat’s components in its temperature range, and avoids large temperature gradients in the satellite using only structure conduction and insulation. No heaters, heat-pipes or other sophisticated devices are required. The attitude determination and control system is responsible for generating position and attitude data for autonomous navigation and for 3-axis stabilization of the satellite. In the rendezvous stage the system is responsible for “closing the loop”, meaning generating position and attitude data relative to the target satellite and activating the control algorithm. The system comprises the following sensors, actuators and electronics needed to control in flight: GPS Receiver; 3-axis Magnetometer; 4 Sun Sensors, 3 Rate Gyros; 2 Video Cameras, Computer, 4 Reaction Wheels; 3 Magnetic Torquers. The attitude control system simulations were fulfilled with the developed model in SIMULINK and results proved the system compliance to TOOLSat requirements. The power system supplies the satellite subsystems with electricity in all operational modes for about 2 weeks, until TOOLSat docking with the target satellite. 3 solar panels with total area of 1.3 m^2 with advanced multi-junction cells of GaInP2/GaAs/Ge having high efficiency of 24.3% provide initial power in sunlight. The battery made up from Li-Ion cells support on board voltage of 28.8 V with specific energy of 210 Whr. The TOOLSat propulsion system includes seven RAFAEL 25N Hydrazine monopropellant thrusters, a RAFAEL Pept-420 fuel tank, a RAFAEL GSU-1L pressurization tank, five latching valves, nine valves, eight filters and 2.5 meters of pipeline. The total mass for this system is 11kg without propellant, and the propellant tank can carry along 30kg of hydrazine. The pressurization tank was chosen to be separated from the fuel tank in order to carry maximum fuel, which means maximum lifetime for the target satellite. The rendezvous mass is defined as the satellite mass at the moment that it docks with the client. At this point TOOLSat has burned about 7kg of maneuver propellant, and 23kg of payload propellant remain. Thus, after docking, the thrust module of the TOOLSat is capable to provide orbit maintenance for the serviced satellite for about 3 years, depending upon orbit altitude, with a reliability of 0.85. The total mass of TOOLSat is 160kg that means that satellite belong to sub class minisatellites (100-500kg). The estimated cost of development, manufacture and launch is about 40M$; the estimated cost of each additional satellite in mass production is 10M$, thus the on-orbit servicing is economically advantageous. The TOOLSat project shows that the idea of a service small satellite is not only feasible but also cost productive and being pursued by different organizations around the world.